It's not often I can say my name is in the headlines, but I can today! It's the Half-Square Headlines, an absolutely delightful newsletter published by Michelle Bartholomew. Michelle's is one of just a handful of newsletters I receive in my email inbox, and for good reason.... the Quilter's Spotlight - a glimpse into the lives of fellow creators, a captivating round-up of interesting quilt-related links, "Quilt Crush" where she highlights a favorite beautiful quilt, and the clever "Text & Textiles," a new themed fabric-grouping each issue. And more! So nicely done and curated with care, I have no doubt you'll enjoy it too. 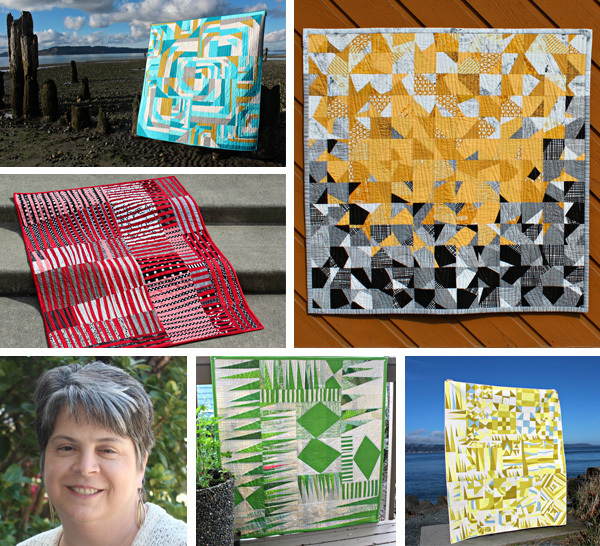 It's an honor to be the subject of Michelle's Quilter's Spotlight in her latest issue. If you'd like to get to know me better, see where I sew, or just take a few moments to enjoy a lovely collection of quilt-related content, take a look. Click here to subscribe to Half-Square Headlines! It was such a treat to get the newsletter this morning and read more about you, Debbie! I enjoyed that article and newsletter Debbie. Thank you for pointing me in that direction. Congrats on being featured, Debbie! I sure enjoyed reading the newsletter! I sure enjoyed learning more about you, as I have been a follower, and inspired by you for a long time. Oh well done you, congratulations. I haven't read it before but I'm off to read it now. Your quilt story was very interesting to read, and we have one thing in common, we are not satisfied with our work until good pictures have been taken of it.